Artists using cutting-edge technology and forensic analysis have reconstructed a series of lost masterpieces, including versions of Monet’s Water Lilies and Van Gogh’s Sunflowers. The re-creations are the work of Factum Arte, a group of artists and technicians whose projects have included an exact reproduction of the burial chamber of Tutankhamun. The Concert, a 17th-century work by Vermeer which was stolen in 1990 in the biggest art heist of modern times, has also been re-created, along with a 1954 portrait of Winston Churchill by Graham Sutherland, which the wartime leader’s wife, Clementine, destroyed in disgust. Factum Arte uses 3D scanners originally developed for medical purposes to record the surface of a painting or an object down to the finest brush-mark or crack. It detects details that the naked eye cannot, recording surface not colour. “By removing the colour from the surface, you can see things completely differently,” said Adam Lowe, director and founder of Factum Arte. Other tools include 3D scanners to record shape. 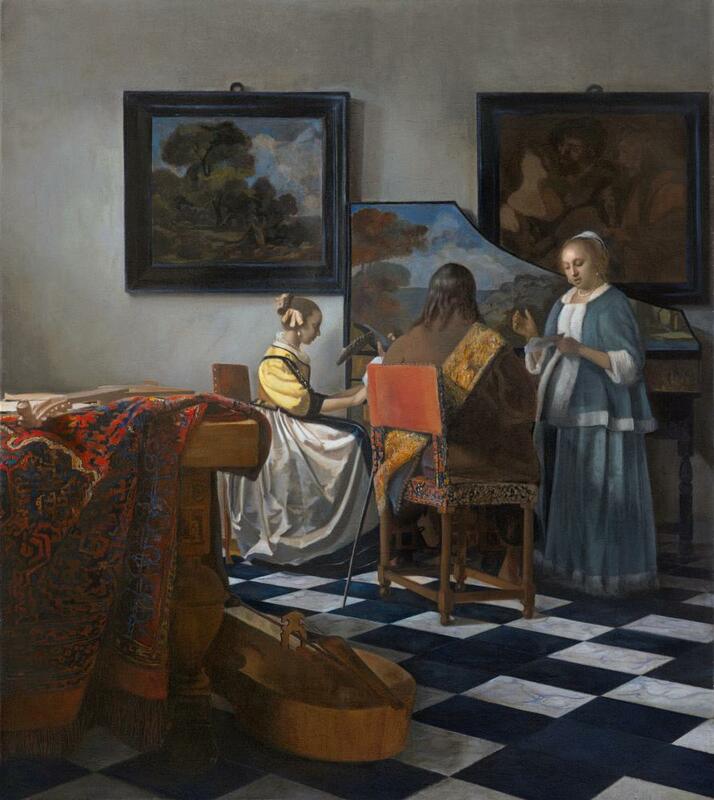 Johannes Vermeer’s The Concert, stolen in 1990, has also been remade. One of Monet’s smaller Water Lilies canvases was hanging in the Museum of Modern Art in New York until 1958, when it fell victim to a catastrophic fire. Despite bad smoke damage, forensic analysis extracted crucial details of its colour and surface, allowing the painting’s rendering of the movement of light on water to be re-created. Van Gogh’s lost Sunflowers picture was one of seven painted in 1888, and was bought by a Japanese collector. It was destroyed during the US bombing of the city of Ashiya in 1945. The National Gallery allowed Lowe’s team to scan its Sunflowers painting, enabling them to reconstruct the artist’s brushstrokes in painting at speed. The Concert tops the list of the worldʼs most-wanted paintings. Valued at $200m, it was among 13 works stolen from the Isabella Stewart Gardner Museum in the US city of Boston. Relying on a couple of poor photographs, Lowe’s team was also able to scan a Vermeer from the same period in the Royal Collection. The Churchills thought they had seen the last of Sutherland’s portrait. Commissioned by parliament for Churchill’s 80th birthday, it was loathed by its subject, who said it made him look “half-witted”. Clementine had the painting burned, which Sutherland condemned as an “act of vandalism”. Other reconstructions include Klimt’s vast Allegory of Medicine, which was seized by the Nazis and taken to an Austrian castle where, in 1945, a retreating SS unit destroyed the castle with the Klimt inside. “It’s a very dramatic tale,” Lowe said. Using one black-and-white photograph and a coloured detail, his team remade the entire work.